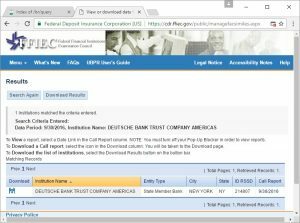 The FFIEC Call Report Ontology is a RDF/OWL representation of Form FFIEC 031, which is used for banks with both domestic and foreign offices. For banks in the U.S., one of the key reports required to be filed is the quarterly Consolidated Report of Condition and Income, generally referred to as the call report or RC report. 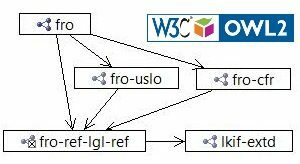 This article describes the ontology classes and how to query the FFIEC data set with SPARQL. The Financial Regulation set of ontology modules started out as an operational ontology for Hedge Fund compliance. We had a need to directly tie encoded rules to their requirement specified for Investment Companies & Advisers in the Code of Federal Regulations (CFC) and United States Code (USC) paragraphs. The CF/USC class structure is generic for all laws and regulations. So we extracted Financial Regulation Ontology for reuse in all Financial Industry. The operational ontologies for investment management have RDF/OWL version of forms ADV (advisers) and PF (private funds). People asked for a Banking example and we now provide for FFIEC 031. This report collects basic financial data from commercial banks in the form of a balance sheet, an income statement, and supporting schedules. The Report of Condition schedules provide details on assets, liabilities, and capital accounts. The Report of Income schedules provide details on income and expenses. This report is a primary source of financial data used for the supervision and regulation of banks, and is used as an editing benchmark for many other reports. (Federal Reserve). The Federal Deposit Insurance Corporation (FDIC) audits filed call reports. The Federal Financial Institutions Examination Council (FFIEC) is the formal interagency body. The choice for FFIEC 031 as a bank example is opportunistic, because the FFIEC publishes forms, consolidated reports and individual institution record in XBRL, XSD and XML. We are familiar with the requirements from Comprehensive Capital Analysis and Review (CCAR) work. FFIEC 031 values feed into FFIEC 101, the Regulatory Capital Reporting for Institutions Subject to the Advanced Capital Adequacy Framework and must reconcile with the Federal Reserve FR-Y-9C, Treasury TIC reports and other filings. 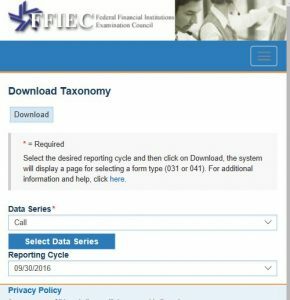 Taxonomy – a Zip file with XSD schema for FFIEC extensions to XBRL instance, linkbase, versioning and the Call Report Micro Data Reference Manual (MDRM) elements. An XBRL instance file for the selected bank period and report. The concept of semantic processing of forms is that information can be (better) represented in Ontology Web Language (OWL) than conventional syntax only XML. We reverse engineer the taxonomy into a set of OWL (TTL turtle notation) files. 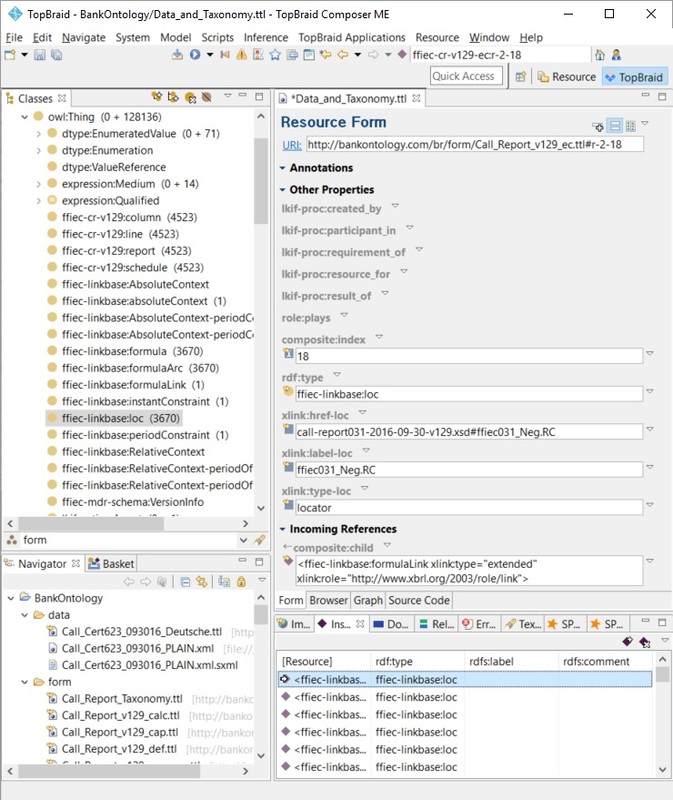 The filed XBRL provides RDF instances for the ontology classes. 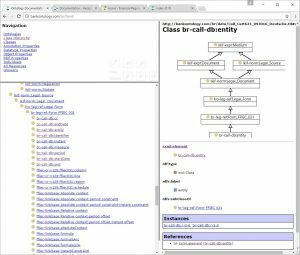 Having classes and instances, we can browse the information and run SPARQL queries. The proof of the concept is to reproduce the FFIEC Excel worksheet with a SPARQL query in the individual institution filing. We compare the original FFIEC worksheet with the Excel exported from the ontology tool. 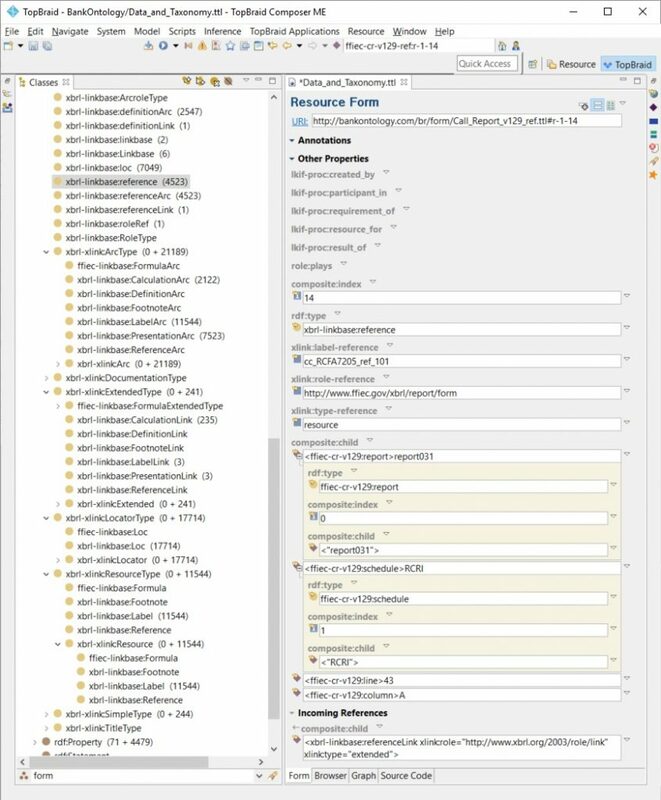 Loading laws and regulations XML into the ontology. FFIEC extends the XBRL structure for report, schedule line item and column. The linkbase classes hold instances to store formulas and connect them to items. The MDRM is represented as a long list of element classes. The reported values are instances of the MDRM class. We only show one filing (Deutsche Bank Trust Americas Corp) here. XBRL classes are populated with instances to represent the structure of the form and reports. Ontology tools TopBraid Composer and the open source Protégé facilitate SPARQL queries of the loaded ontology. Just follow the instructions of the FRO tutorial chapter 1 and use Data_and_Taxonomy.ttl to load the ontology online. Note that there are no semantic enhancements at this point. All joins are simple text label comparisons as in the original source. The query in the appendix and here for download reproduces the FFIEC spreadsheet for an individual bank. 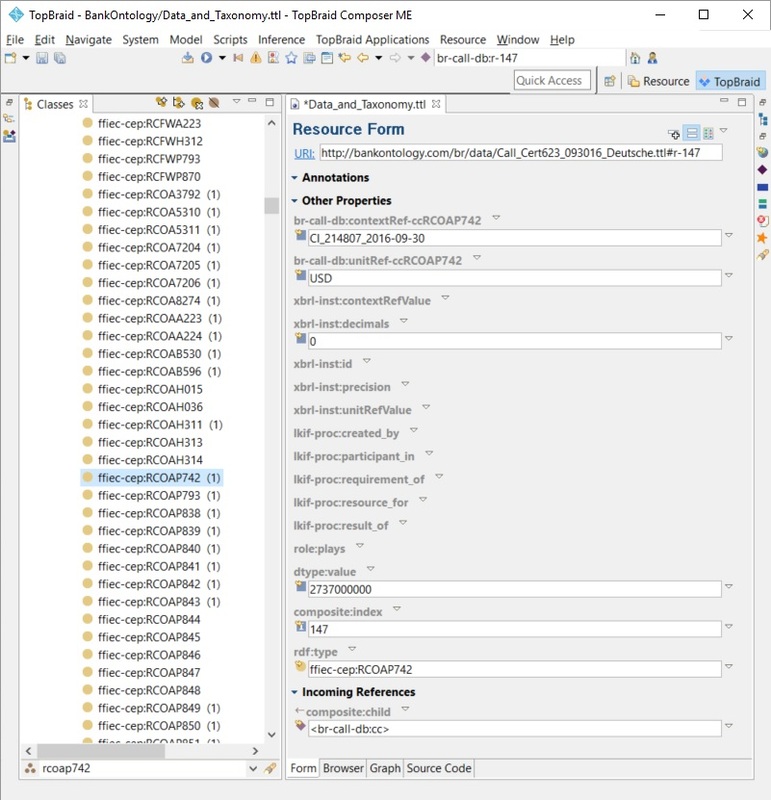 The query directory has the result set Excel for FFIEC report as well as an expanded version (SELECT *) that contains all resources joined. Here are the FFIEC spreadsheet and the Ontology result set Excel side by side. Bank Regulation Ontology has reproduced the FFIEC dataset for an individual bank DBTCA. Enhance the raw import with semantics. First to add object properties directly linking concepts, items, link base, formulas, presentation. This will replace the string comparisons in the query with type controlled relationships. Then we can also depict the graph of connected FFIEC classes and individuals. Load the taxonomy into LKIF This is the same as we did for a real ontology model of USC and CFR. Load the report financial information into FIBO classes. The Fund Ontology already has an example of FIBO populated with Investment Advisers from the Securities and Exchange Commission form ADV (advisers) compilation report. To populate the Call Report classes with financial information from FIBO instance. This is the reverse direction of step two. also available for download in the query directory. A snapshot of the Query result set. The full excel can be downloaded here. # form the raw XBRL/XML ontology import. The result only contains columns with a value (no redacted or derived items). # The call date and RSSD are global identifiers of the file. # We start top-down with the schedules. Add a line here to retrieve a particular schedule only. # The schedule is composite child of the Linkbase reference. BIND ( fn:substring (?lb_label_loc, 4) AS ?MDRM) .